Rare and early Bunnykins cup and saucer by Barbara Vernon. Carrying the early Bunnykins mark. Early Bunnykins. Cup = Family with Pram. Royal Doulton. Signed by Barbara Vernon. Apologies for photographs as it is hard to see, but both cup and saucer are signed by Dorothy Vernon. This decorative cup and saucer have been previously owned and are now discontinued but these are second quality but in excellent condition. Sairey Gamp in the 1908 - 1931 era colour-way, no pattern number. Fine crazing to cup and saucer, very slight loss of green trim to rim of cup, two tiny nicks to the rim of the saucer which appear to have been 'coloured in' (see photo), no other faults. 6 Royal Doulton ‘Expressions’Strawberry Fayre tea cups and saucers. A ROYAL DOULTON CUP AND SAUCER IN THE DESIGN "THE KIRKWOOD". THE CUP STANDS 2.1/2in. HIGH BY 3.3/4in. THE BASES ARE BOTH FULLY STAMPED AS SHOWN IN THE PHOTO'S. Any white areas in my photographs are purely light reflection. Inspired by Arthur Rackham's illustrations for Peter Pan in Kensington Gardens, London 1906. IT'S A GREAT ITEM THAT WILL ENHANCE ANY GOOD BRAMBLY HEDGE COLLECTION. SAUCER IS APPROX 5 1/2 " ACROSS. CUP IS APPROX 3" HIGH. FULLY MARKED ON THE BASE 1st QUALITY. Excellent Condition. Royal Doulton Translucent china. Pattern TC 1023 Moonstone. Decorated with stylisedflowers on a borde. Ref 120 - 1. Vintage 1930's Single ROYAL DOULTON 'COUNTESS' Rare Set Of 6 Saucers Green VGC. Dispatched with Royal Mail 2nd Class. In very good condition just the usual light utensil marks. Brambly Hedge Miniature Autumn Tea Cup and Saucer. A miniature Brambly Hedge “Autumn” tea cup and saucer designed by Jill Barklem dated 1983 and produced by Royal Doulton. This miniature tea cup and saucer have been previously owned but are first quality in very good condition. Royal Doulton transluscent china which was made in England. Old Colony pattern TC1005. Decorated with a blue and brown floral centre. Ribbed border, blue rim with leaves. A lovely rare Royal Doulton Brambly Hedge 'The Birthday' saucer in Very Good condition. Jill Barklem 1987. No chips or cracks from smoke & pet free home. Royal Doulton bone china – Made in England. Collection in person available. These cups and saucers have been used once and are in perfect condition. The box has a few scuffs but still fine for a gift. IT'S A GREAT ITEM THAT WILL ENHANCE ANY GOOD BRAMBLY HEDGE COLLECTION. SAUCER IS APPROX 5 " ACROSS. CUP IS APPROX 2 1/2 " HIGH. TEA PLATE IS APPROX 6 1/4 " ACROSS. 4 x ROYAL DOULTON OXFORD GREEN CUPS AND SAUCERS. This is a Royal Doulton Alton gravy boat & saucerl. Beautiful Item! Item weight : approx. We're digging up stuff thats rare, for anyone of you to share. Conditions. As seen in pics. (UK Recorded £FREE). THE CHINA IS MARKED AS A MIXTURE OF FIRST AND SECOND QUALITY WITH NO OBVIOUS FAULTS SHOWING ON THE SECONDS. THESE TRIOS WOULD MAKE BRILLIANT ADDITIONS TO ANY CARLYLE COLLECTION ESPECIALLY AS THEY ARE IN SUCH SUPERB CONDITION. A rare first quality “Rigging The Boat” cup and saucer designed by Jill Barklem from the Royal Doulton Brambly Hedge Collection. Rigging The Boat Cup and Saucer. This decorative cup and saucer are now discontinued and these have been previously owned but are first quality and in excellent condition. "CRANBOURNE". ROYAL DOULTON. SET OF 6 (SIX). 6 x Royal Doulton Bristol Replacement Teacup Saucers 6"
Royal Doulton's Desert Star pattern (No. Marrying atomic age design motifs with beautiful elegant style, made with all the quality one associates with classic Royal Doulton tableware. ROYAL DOULTON, 'DESERT STAR' PATTERN, COFFEE SAUCERS. ). The cup and saucer have been previously owned but are first quality in very good condition. A now hard to find “1998 Year” cup and saucer designed by Jill Barklem from the Royal Doulton Brambly Hedge Collection. This decorative cup and saucer are now discontinued but these are first quality in excellent condition. ROYAL DOULTON MARTINIQUE GRAVY BOAT AND SAUCER, H 5188, 2nd. ROYAL DOULTON "MARTINIQUE" GRAVY BOAT AND SAUCER. THE GRAVY BOAT STANDS 3 1/2" HIGH TO THE TIP OF THE POURER AND IS 9 1/4" LONG. MARKED AS A SECOND, REASON NOT APPARENT. BRIGHT COLOURS AND GILDING, CLEAN INSIDE AND OUT. Royal Doulton Brambly Hedge Miniature Winter Cup and Saucer. 1st Quality. 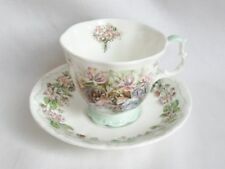 ROYAL DOULTON SPRINGTIME CUP AND SAUCER X 4. BRIGHT AND CLEAN INSIDE AND OUT. (All sizes approx.). Make Supersized Seem Small. Get Images that.